With the right priorities and development strategies, India’s smart cities initiative has the potential to make cities more sustainable, inclusive, and safe. Photo by rebel/Flickr. 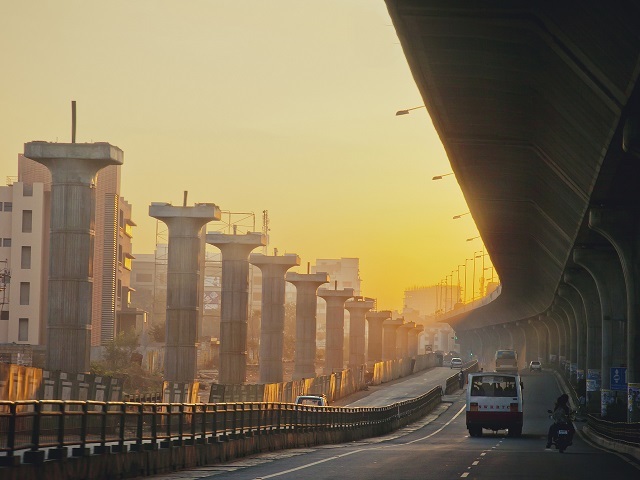 In June 2014, the Government of India announced its ambitious plan to build smart cities across the country. This plan will be administered by the Ministry of Urban Development, and will focus on building new smart cities and redeveloping existing urban regions with populations of over 100,000 people. The government announced last July that it will invest US$1.2 billion in smart cities over the next year, which will be supplemented by funding from private investors and foreign players. The program will include city-wide developments to improve methods for engaging citizens and addressing their needs, building capacity among city officials, and moving to e-governance through use of technology. Cities will also be asked to develop holistic city development plans with a vision for zero emissions and zero waste. They will then be provided funding to pursue strategic infrastructure projects as part of the city development plan. Cities will be asked to identify priority sectors and will receive viability gap funding from the central government. The private sector is expected to invest another INR 1000 – 1200 crore (US$1.6 – 1.9 billion) in these projects. Additionally, states will be asked to identify areas for large investments, either for retrofitting or redevelopment in existing cities or greenfield cities. The national government envisions investing 15% to 20% of necessary financing, with the rest of the funding coming from the private sector. To make the most of this push for smarter cities, city and national leaders need to plan a comprehensive urbanization strategy, taking advantage of the latest developments in technology, creating employment opportunities, and supporting economic activities that will improve quality of life for citizens. By focusing on improved mobility and access, good urban design, equitable land management, and accessing the required financing, India’s cities can grow efficiently, sustainably, and inclusively, transforming urban life across the country. As cities grow, the demand for transport grows, as well. Increased investment in public transport systems and a focus on transit-oriented development (TOD) are necessary to make cities more energy efficient, better connected, and less polluted. Further, cities must focus on the financial sustainability of public transit projects through managing subsidies, pricing, and private investment in public transit, while also allowing for equitable access. Facilitating the use of disruptive new technologies and data for improved transport operations and safety can also encourage entrepreneurship and innovation in future investments. For example, EMBARQ India’s Bus Karo 2.0 – Case Studies from India report provides multiple examples of how cities can make conventional bus systems and bus rapid transit (BRT) more financially sustainable and efficient, reducing the need for private cars. Beyond buses, we’ve also seen how new reforms and regulations can help auto-rickshaws support public transport by improving last-mile connectivity. At the neighborhood or community scale, smart city investments will be strongly influenced by building codes and development control regulations. When well thought out, these regulations help improve walkability, transit use, road safety, energy consumption, and carbon emissions. At the city scale, good governance involves a focus on the urban design strategies of TOD and mixed-use development. These strategies support housing development near transit and employment opportunities, short trips lengths, and safer walkability in all parts of the city. One Indian city pursuing this type of development is Naya Raipur. Together with EMBARQ India, the Naya Raipur Development Authority has prioritized bike and pedestrian networks, open public spaces, and mixed-use development to create a safer, more accessible, and more inclusive neighborhood design. Cities have a variety of land aggregation and management strategies to acquire land and make it available for development in a cost-effective and inclusive way. These tools allow cities and developers to make infrastructure investments while compensating existing residents in an equitable fashion. Eight different instruments have been used by different agencies in Indian cities with varying levels of success. These include bulk acquisition through the newly updated land acquisition act; the town planning scheme mechanism used mainly in Gujarat; the 12.5% reserve price mechanism used by the City Industrial Development Corporation in Navi Mumbai; land pooling mechanisms in Delhi; cluster redevelopment policy used in Mumbai; transfer of development rights used in Mumbai and other cities; and accommodation and reservation rules used in Mumbai. The lessons learned from these projects will be extremely useful for smart city investments. A significant portion of the investment in smart cities is expected to come from the private sector or through public-private partnerships. To consistently access finance, monitor progress, and ensure accountability from city leaders, use of city-level performance metrics across economic, social, and environmental indicators is essential. This will also help attract private investment in cities. Nearly 600 million people will call urban India home by 2030. We must take advantage of the government’s efforts to build smart cities to ensure these cities are sustainable, inclusive, and safe. Prioritizing sustainable mobility, urban design, land management, and finance, we can create smart and sustainable Indian cities and improve quality of life for millions.